ETP’s Mobile Shop-in-Shop (SIS) solution helps you to better manage your Shop-in-Shop counters/stores, CRM and inventory on a convenient mobile platform in your SIS/consignment location within department stores. It empowers your store staff with the technology to better manage your customer experience by being able to search products, receive and dispatch inventory and ring up sales. You can now make your replenishment more efficient to avoid over and under stock situations with online information of sales movement by the minute. It removes the hassle of doing reconciliation with department stores on periodic sales and collection. 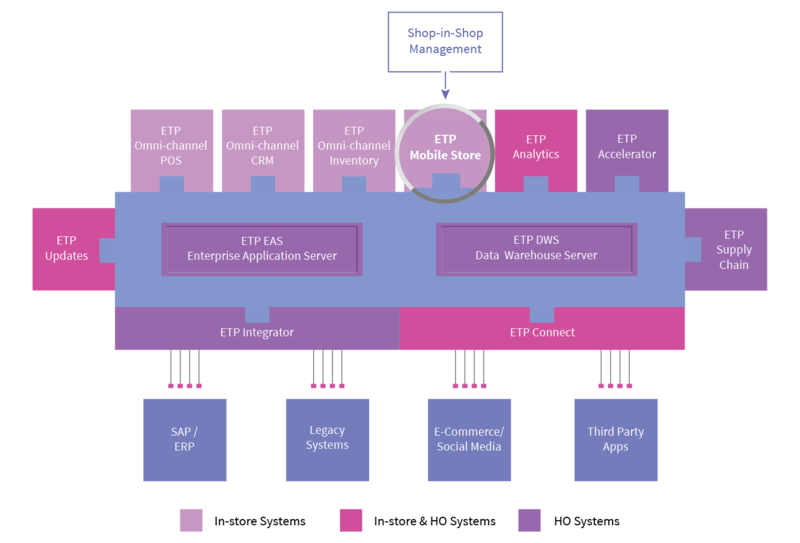 Built on a technology that supports both Android and iOS, the ETP Mobile SIS solution integrates with the highly scalable and proven ETP EAS central server and seamlessly synchronizes with ETP’s POS, Promotions, Supply Chain and Analytics solutions. You can host the solution in premise or on the cloud, on virtually all platforms.